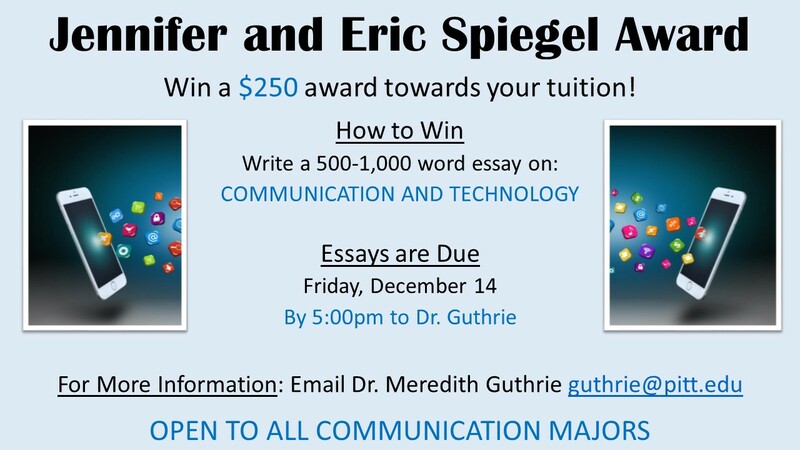 The Department of Communication is proud to announce the annual competition for the Jennifer and Eric Spiegel Award. The purpose of this award is to encourage and foster scholarship in the department. The winner will receive a stipend in the amount of $250.00 to be applied towards your tuition. 1. Be an undergraduate communication major (sophomore, junior, or first semester senior). 2. Be registered in the Spring Term (2194) of 2019. 3. Be a student in good academic standing. 2. Submit TWO hard copies of your essay to Dr. Meredith Guthrie (1413 Cathedral of Learning) by 5pm Friday, December 14. Brent Malin Publishes Article in Communication Theory Journal "Contextual Materialism: Mereology, Sociality and the Vague Ontology of Media Objects"
The William Pitt Debating Union completes a successful fundraising campaign.